Soak the dried figs in cold water and allow to rehydrate for a few minutes. Over a high heat, warm up a couple of tablespoons of EVO oil in a pan, then add the pork chops, previously dusted with flour. Brown both sides quickly then lower the heat. Add rosemary, salt, pepper, the figs and the balsamic vinegar. Allow to cook for a few minutes. As soon as the chops have reached the desired cooking, remove them from the heat and, if necessary, keep on cooking the juice over high heat until you obtain a somewhat thick cream. Should it be too thick already, you can add a spoonful of water. Pour the sauce on the chops and serve. It's important that the meat is cooked à point (medium), so that it doesn't turn out too dry. Use a metal needle to check: when you prick the meat, a clear transparent (not rose-coloured) liquid should come out. That means the meat is ready! This dish goes really well with steamed potatoes and a colourful leafy salad. The best wine for this recipe is Barbera d’Asti DOCG, Amarone della Valpolicella DOCG, Montepulciano d'Abruzzo DOC or Refosco, well structured and balanced. Serving temperature: 18-20 °C. The practice of cooking pork with fruit has always been common place; in fact it is not a secret that already during the Middle Ages it was very common to cook it with plums, apples or chestnuts. 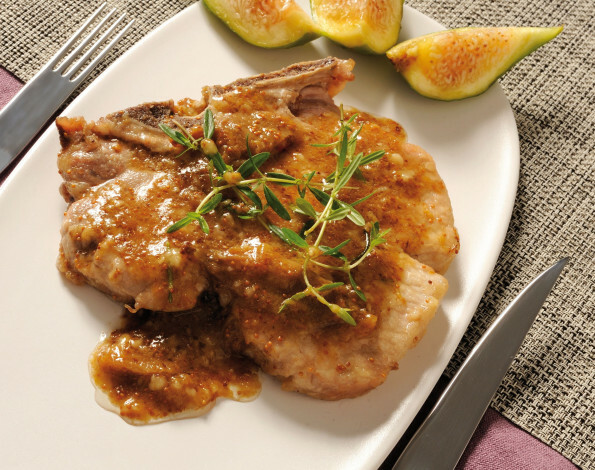 In this recipe, the strong taste of the pork chops, combined with the sweetness of the figs, provide for a harmonious combination that will surely satisfy your taste buds and amaze your guests. Enjoy it and experiment further according to your own personal taste!